Mid October brought a fun 4 day trip with family to Wallowa Lake, in eastern Oregon. Temperatures were in the 30’s to 60’s with dry skies and no rain expected. We were mostly in nature without any need to dress up and we stayed in a heated house. Hiking, hanging out, cooking and being together were the main activities. So, what did I bring on this trip and was it enough, too much, or what? See below with items brought in the photos and items that were not used will be crossed through to indicate that. Main clothes I brought in my small duffle bag: black sweats, black Flashdry long sleeve top, green cotton short sleeve Shirt, 1 pr. socks, 1 pr. 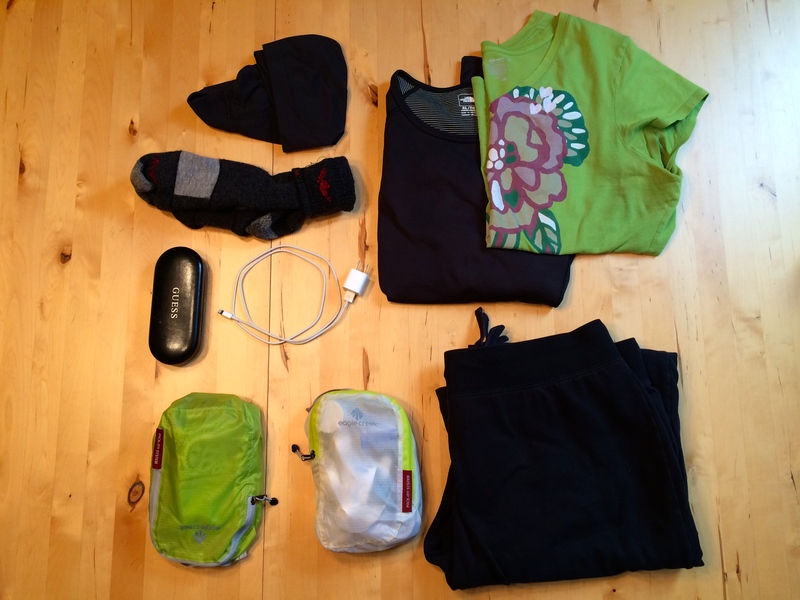 underwear, glasses & case, iPhone power cord and 2 personal items bags. Top layers for colder weather: Reversible vest, scarf, hat, gloves and jacket. 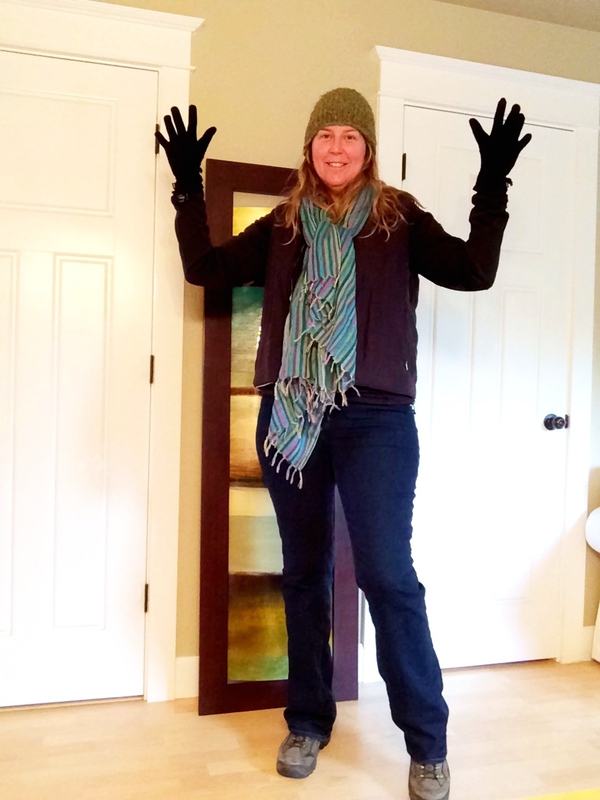 The layers that I wore on the trip there: Jeans, socks, boots, underwear, bra, long sleeve navy shirt, jacket, vest, scarf, hat and gloves. I only brought 1 pair of shoes and 1 pair of jeans and that worked fine for this trip. Looks like I am being held up with my hands up like that. 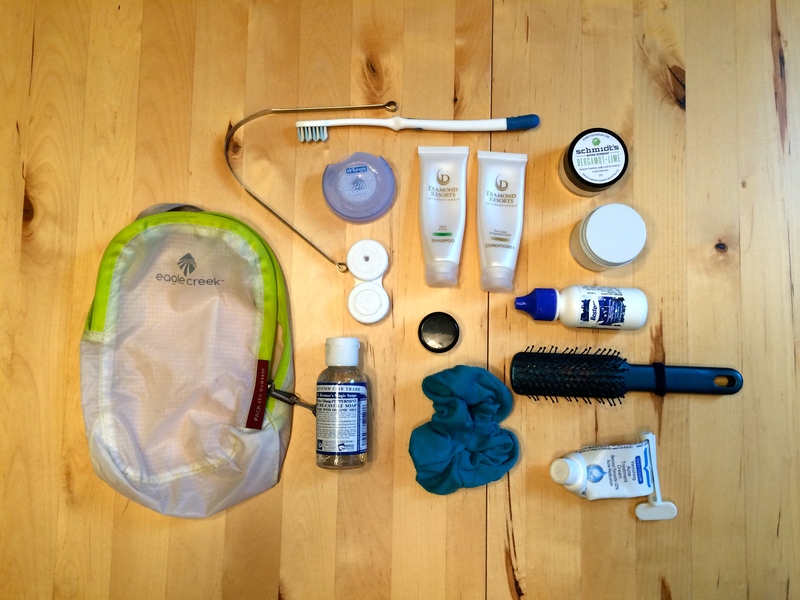 White bag contents: Toothbrush, tooth powder, tongue scraper, floss, contacts & solution, shampoo and conditioner, deodorant, coconut oil as face wash & moisturizer, benzol peroxide, scrunchie, brush, hair band and Dr. Bronner’s soap. I used them all. 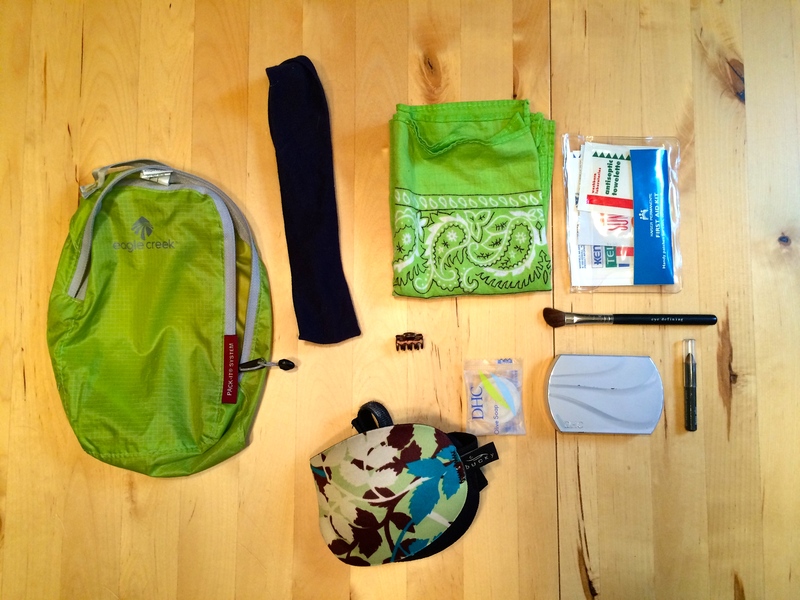 Green bag contents: Headband, bandana, eye mask, soap, first aid kit, make-up (shadow, liner and brush). I didn’t use 1 item in this kit = could have left it at home really, but it didn’t take up much room and some items could have come in handy. 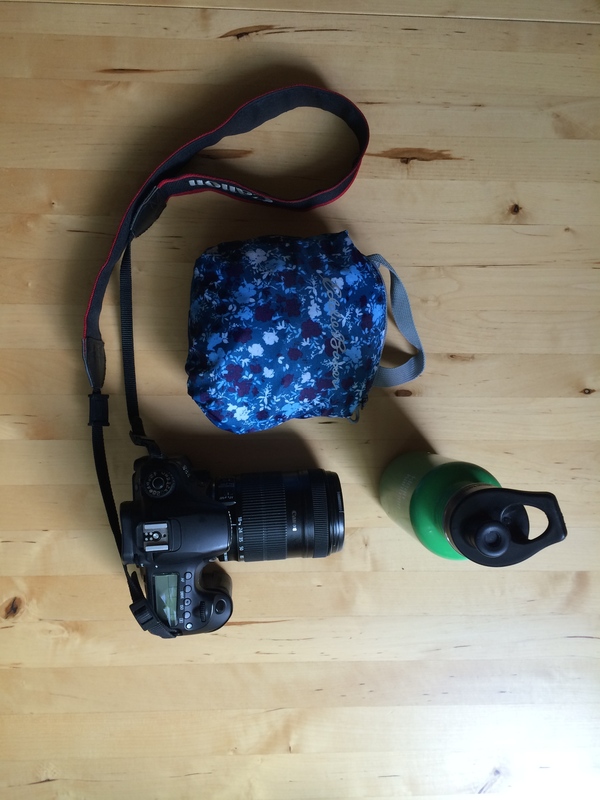 Last minute adds: Daypack that compacts down into small sack, Kleen Canteen and Canon 60D camera. It was nice to have my big camera versus just my iPhone this time. I love taking photos! So on this trip I used everything I brought except for the green bag and it’s contents. I didn’t need to do laundry and I wore every item of clothing I brought. It was warm enough for me to appreciate having layers to adjust without getting hot or cold. Next trip I need to start documenting the food items I bring and how that works out. I brought too much and brought home a lot of food. 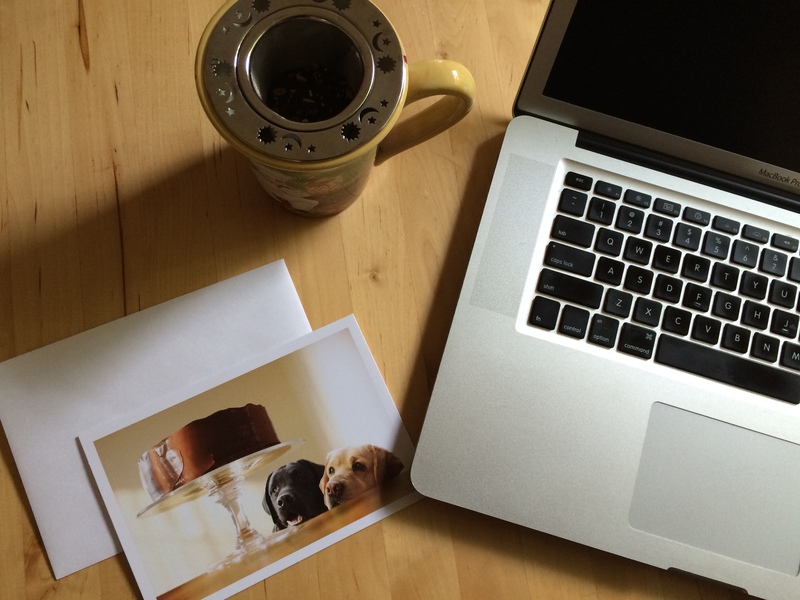 Drinking tea and writing up a birthday card for my son-in-law Ryan. We were headed out to the lake to celebrate his birthday! Nice to take time to reflect just prior to writing the card. Tea seems to help me reflect. 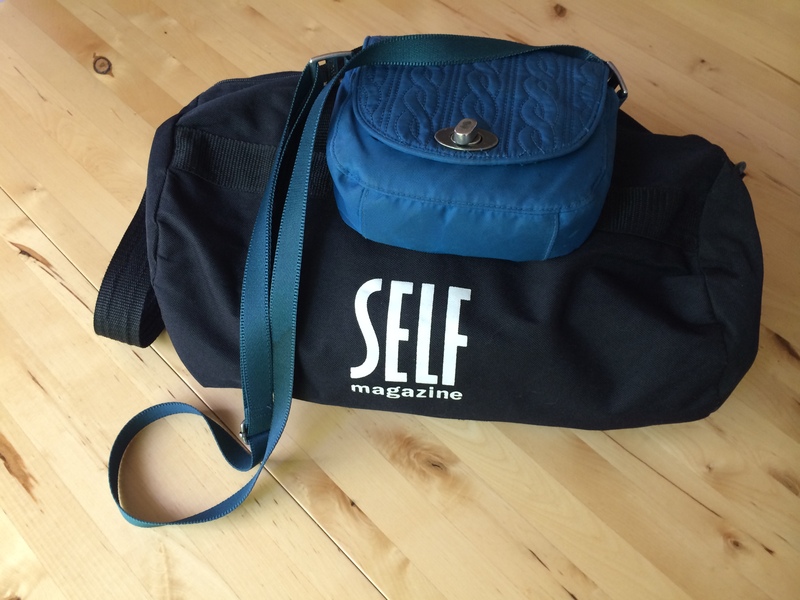 I mostly bring more than I need, even with consciously trying to travel light. It is fun to keep track of what I used and didn’t use to help me plan for my next trip. Have you been on a recent trip? 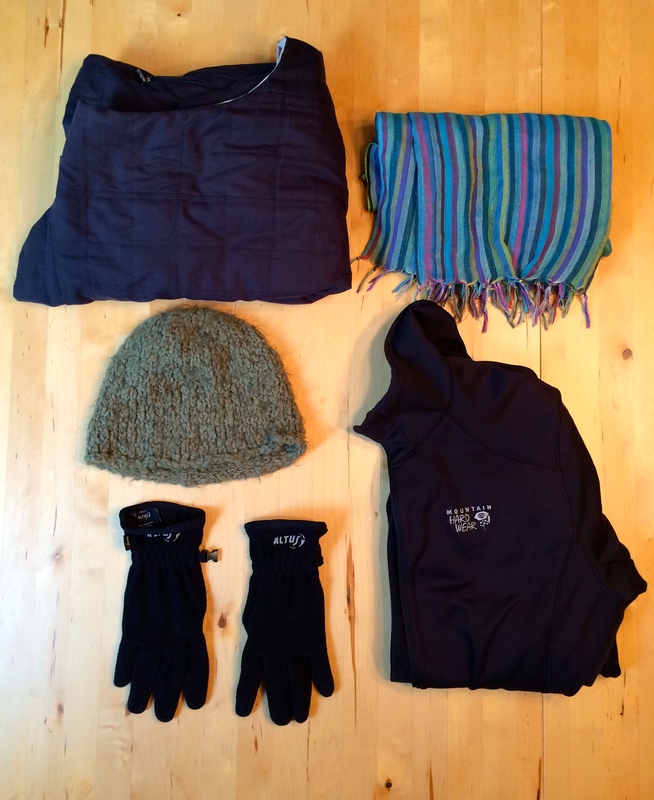 What did you pack and was it enough, too much or did you forget any items you wished you had brought. Interesting post! I like seeing how someone else packs. I went to Seattle in September and I brought too much! I used to pack lighter, and I’d like to get back to that. Ever since I walked the Camino in 2013, I’ve been enjoying travel with less. It becomes a fun game to just bring what I need. Wishing you well in finding that sweet spot for yourself Miriam.